After we re-stocked on 15 Aug , the trout appeared to me a little shy. However, with some cooler weather and rain, the fish began to rise and feed as the the water temperature fell. Unfortunately, our supplier has also been affected by the hot, sunny weather with the trout not feeding that meant the average weight of these stocked fish was 1 1/4 lbs. Not the size that we normally have, but felt we needed to refresh the loch with the weather forecast to improve, which it did. The days after the cooler weather more fish were on the move, and a significant number of anglers have been successful with a variety of “dry” flies. Not all have been successful, but if fish are rising and not taking, then it could be a matter of size or colour. By way of an example, a Black Shipman’s Buzzer was attracting fish, but no takes. The angler had a Claret colour Shipman’s and it was suggested they change. While not used immediately, they later changed and later said they had released 5 using it. Other successful “dries” or surface flies have included Daddies, Black Hopper. Black Gnat and Suspended Buzzers. It’s been a bit of mixed bag of non-dry flies including Bloodworm, Diawl Bach, Damsels (various) and Emergers (including an Olive). A small number of brownies have also been caught varying from 6” to 4 1/2 lbs. With the number of large Brown Trout being caught in recent weeks, we’re begining to wonder how many we have in the loch having stocked them at 2 lbs. 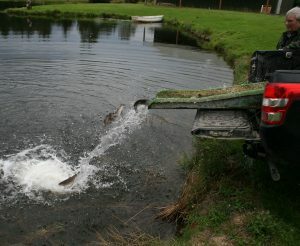 We also pleased that none of the larger brown trout have been taken, with everyone being returned. When we’ve asked why those taking fish have returned them, they’ve replied that with such a nice trout, they want to return later to tempt it when it gets larger. While we were concerned about the size of recent stocked trout, we’ve been pleasantly surprised that anglers have been saying how fit they, often thinking they had a larger fish. While rainbows in 3 to 4 lbs range continued to be reported, the best was 6 ½ lbs. As a rule we do not comment upon basket numbers, but when an angler released 23 for his day, we felt that was a little bit special.